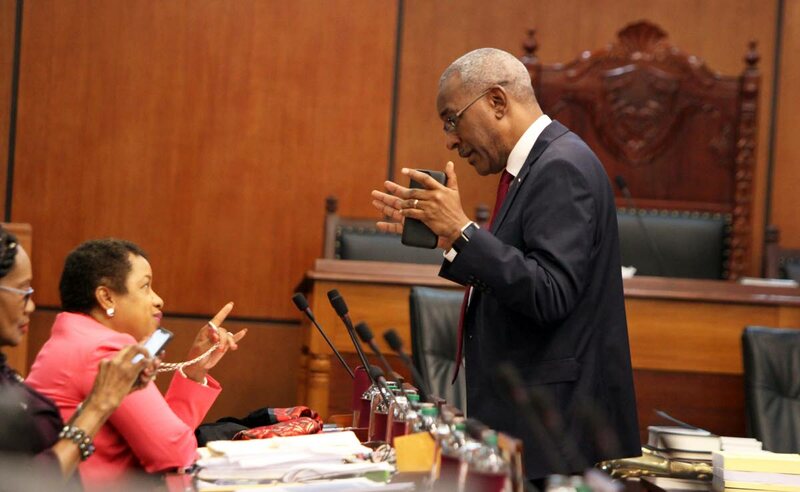 Minister in the Ministry of Finance Allyson West speaks with Public Utilities Minister Robert Le Hunte during a break in yesterday’s Senate debate on the budget. MINISTER in the Ministry of Finance Allyson West says the transitioned Petrotrin will earn this country more than US $200 million annually. She was speaking yesterday during Senate debate on the national budget. She said following a detailed evaluation the difficult decision was taken to close the refining and marketing operations of Petrotrin. She said Government will be focusing in improving exploration and production capacity to maximise the use of these resources. West also reiterated Government’s equipment to the workers of Petrotrin. She said recent developments with the local energy sector signalled to Government that the industry was in recovery. She reported gas production has been increasing with the annual average of 3.8 standard cubit feet per day in 2018 and projected increase to 4.14 billion by 2021. She said this was being driven by an increase in exploration and production activity from partners in upstream sector. She said Government was moving closer to introducing clear and decisive action in addressing transfer pricing malpractices and revenue leakage stemming from commercial and contractual structures of the LNG trains. West said there were two projects Government intended to pursue to allow small producers of renewable energy to feed electricity into the national grid: Utility Scale Renewable Energy project and Waste to Energy Development project. She also criticised the previous administration saying after five years of mismanagement it was critical for this Government to establish a system of credibility and trust. She said this budget has built on this administration’s prudent fiscal strategies. She said between 2010 and 2015 the government collected untold levels of revenue and spent even more untold levels of expenditure. She said this Government had to engage in a series of adjustments of expenditure to give the country breathing room. She said this country avoided seeking support from organisations like the International Monetary Fund and sparing the country from harsh austerity measures. Reply to "Transitioned Petrotrin will earn US$200m annually"